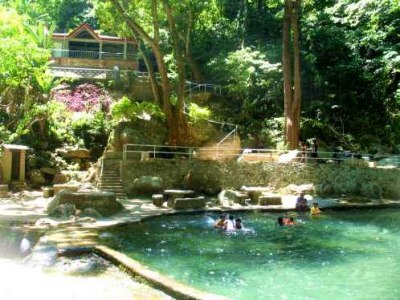 The seven volcanoes of Camiguin not only created the unforgettable skyline, they also enrich the waters of the hot, cold and soda springs. 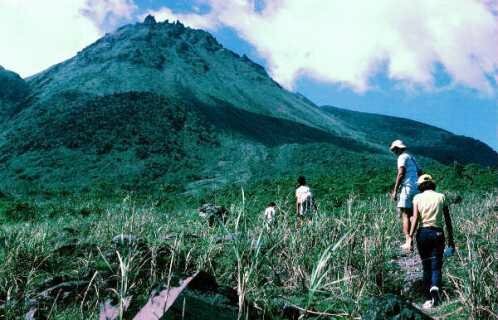 If you have a good physical condition you may hike up to Mount Hibok-Hibok or at least Old Volcan Daan. The waterfalls are among the highest in the Philippines. The fauna and flora of Camiguin are unique in the Philippines. Where else can you easily get access to a rainforest with giant bamboo and fern trees. Where else are leguans crossing your trail, eagles and falcons are soaring in the skies and turtles are hatching on your beach. 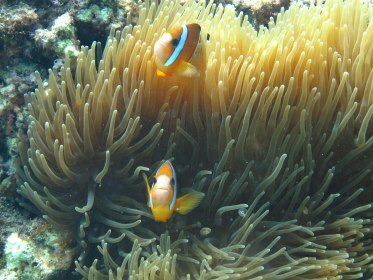 The protected under water world makes Camiguin one of the best dive spots in the Philippines. Snorkelers and divers are always surprised by the diversity. Be sure you won't leave Camiguin without having met with sea turtles and giant clams, with soft and hard corals and of course Nemo! This list is strictly in alphabetic order. The water of the Ardent Hot Spring is up to 34°C warm. It is heated by the volcanic activity of Mount Hibok-Hibok. There are several pools and a large recreation area. The Ardent Hot Spring are 3.5km off the ring road either at Brgy. Bug-ong or Brgy.Agoho, just 2km north of Mambajao. A visit takes 1 hour. Add spare time for a bath and maybe lunch at the restaurant. Many guests also appreciate the massages. So add at least another hour. Swimming suit, hat, sunglasses and sunscreen. Nicely arranged pools with warm water in a shadowy place. We did not like the very loud music that covered the whole area. But in the last months they lowered the noise level. Also with the Ardent Hot Springs is now a nature park with plants and animals. We have not yet visited. Take a warm bath and maybe have lunch or dinner at the restaurant. The Ardent Hot Spring is open from 06am to 10pm (except Wednesday morning, when the pool is emptied for cleaning). Ardent Hot Springs is also resort. You may rent a room or a bungalow up there. But until 10 p.m. there may be loud music. A good idea is to go to the Ardent Hot Springs for relaxing after a day of hiking. After sunset the air seems to be much fresher when coming out of the very warm water. Entrance fee is PHP 30. Tables and sheds are from PHP 30 to 100. They charge you a cork fee of PHP 50 per bottle, when you bring your own drinks. A bolo is a large cutting tool similar to the machete, used particularly in the jungles of the Philippines, and in the sugar fields of Negros. The primary use for the bolo is clearing vegetation, whether for agriculture or during trail blazing. The bolo is called an itak in Tagalog while in Hiligaynon, the blade is referred to as either a binangon or a talibong. A Filipino without his bolo isn''t a real Pinoy. 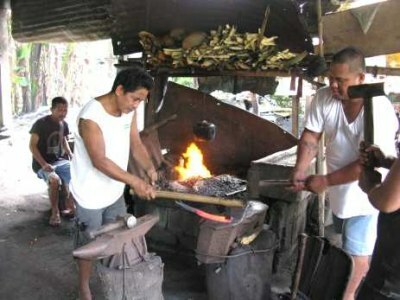 The Blacksmith of Mambajao are on the national highway eastbound of Mambajao. It is a 10 minutes walk from the center of Mambajao, but you can also take a motorela for PHP 7.00 per pax. A bottle of fresh water. The blacksmit's work is a hot job. Bolos are also used as military weapons and as such they were a particular favorite of the Filipino resistance during the 1898 Philippine Revolution against Spain, the Philippine-American War, and the Commonwealth period. Since the bolo was first used as a farming implement, it was used in combat because during colonial times the ubiquitous bolo was readily available to the common person. For this reason the study of the bolo is common in Filipino martial arts, such as Balintawak, Pekiti-Tirsia Kali and Modern Arnis. + The all-purpose bolo: Used for all sorts of odd jobs, including breaking open coconuts. + The haras: Similar to a small scythe, it is used for cutting tall grass. + The kutsilyo: The term comes from the Spanish word cuchillo, meaning knife. Generally used to kill and bleed pigs during slaughter. + The bolo-guna: A bolo specifically shaped for digging out roots and weeding. + The garab: Used to harvest rice. + The sundang: Supposedly used mainly to open coconuts. The sundang, also called "tip bolo" or itak, was a popular weapon of choice in the revolution. + The pinuti. A large bolo. Follow with your eyes a bolo getting formed from an old, broken truck spring to the final sharp object. But if you like, you may try yourself. 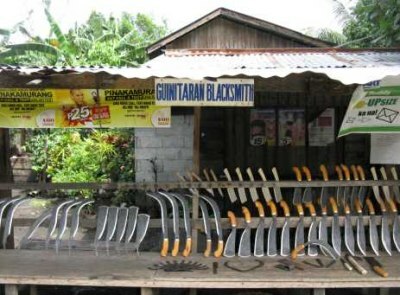 Ask a blacksmith if you may try. There will be lots of laughters when you start prespiring. The large smit's hammer has its weight! The blacksmith will be helpful and will give you hints and show you tricks. You may buy your own bolo. The bolo is considerd to be a weapon (see above). On some ferries you will be requested to hand over your bolo to an officer during the journey. For domestic and international flights you will have to put the bolo in your checked luggage. But prior to buying one, make sure that the laws in your country do allow the import. None. Motorela PHP 7.00 per pax. 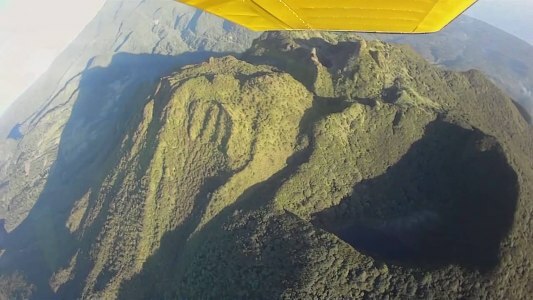 Now you can fly over and around Camiguin. Maybe you already got a glimpse on WHite Island when approaching the island with the airline. Now you can see everything much better from a small plane with a pilot who knows "his" island. Flights last between 20 minutes and 1 hour or more. Count about one hour before take-off and one hour after the flight. The hour before the flight is needed to prepare the aircraft and answer all your questions. The hour after the flight you will need to bring your hearth to ground and tell everybody about your newest outstanding experience. Sunglasses will make vision more comfortable. And your camera will allow you to share your experience with your family and friends. Enchanting jaunts to Mantique and White Island. 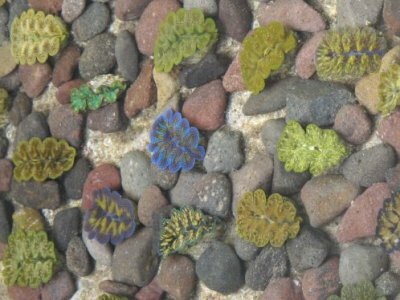 View the vibrant colors of surrounding coral waters from above. See the whole island including the unknown Mt. Mambajao volcanic dome and mysterious Hibok-Hibok crater. Camiguin Aviation is a CAAP certified and SEC registered flying organization that specializes in sightseeing and Acro-Adventure flights. Camiguin is one of the best dive spots in the Philippines. 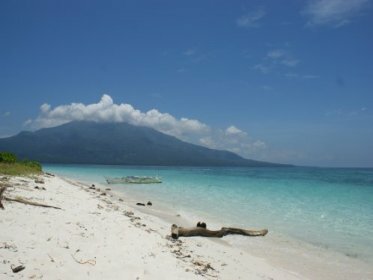 Many divers come back to the island year after year because the dive sites in Camiguin are very various. Most dive bases do have their own boats and some sites are even accessible from the beach. For Mantigue think of one full day with 2 to 3 dives. These are "from" rates. Some resorts charge more, even much more. Compare their rates. 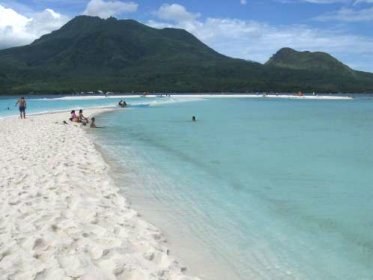 The youngest volcano in Camiguin, and the only historically active one, is Hibok-Hibok. It lies at the NW end of the island, about 6 km NW of Mt. Mambajao. This andesitic-to-rhyolitic volcano contains several lava domes, including Mt. Vulcan on its NW flank. Major eruptions during 1871-75 and 1948-53 formed flank lava domes at Hibok-Hibok and produced pyroclastic flows that devastated coastal villages. The time you need depends on your physical condition and the weather. A person with a good normal condition needs 3 hours to climb and another 3 hours to descend. The current record is 1h20 to climb. This record had been established in 2012 by a young Swiss guy. If weather allows, you may want to stay on the top until 2 p.m. It is even possible to sleep up there. But beware, at 1'300 meters the nights get fresh. Even if locals climb in sandals, we strongly recommend hiking boots. Take also a waterproof vest and maybe a walking stick with you. You will also need enough water (2-3 liters) and some food. A hat, sunglasses and sun-screen are mandatory because of the nearly vertical sun-rays around noon time. Don't do the trip without a guide from the island. Ask for at your resort's reception desk. First of all experience an active volcano. You may see, hear and smell fumaroles. The crater lake is astonishing. It isn't deep and almost overgrown with swimming plants. 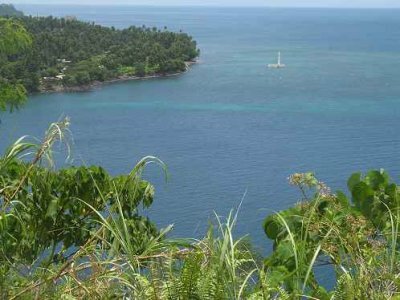 On a clear day you have 360° view over Mindanao and the southern Visayan islands, namely Bohol and Leyte. On extremely clear days you may see Siquijor and Negros. Nestled in a cove near Cantaan is a beautiful beach with white sand. This beach facing Mindanao is already a surprise. Its officil name is Kabila White Beach. Actually the real surprise is the Giant Clam Nursery. Cantaan is only 22km from Mambajao but well hidden. Best transportation is your own rented motorbike. It takes some 30 to 40 minutes to get there. You may first miss the intersection leading to Cantaan. So when you see the wharf of Guinsiliban, make an U-turn. On your way back (about 500 meters), you will see the welcome sign of Cantaan with its Mickey-Mouse. Continue straight through the Barangay. The road is 95% of concrete and sometimes rather steep. When you are in Cantaan, don't miss the mangroves. Mangroves are interesting trees. They grow in the salty Ocean-Water and protect the coast from errosion. It is possible to get there by jeepney/bus and tricycle. But then you have to hire the vehicle for half a day or the whole day. Swimming suit, mask, snorkel, fins, hat, sunglasses and sunscreen. Already the trip to the south coast is worth to drive slowly. (See Island Roundtrip). If you have never seen Mangrove trees, you should stop in Brgy. Cantaan near the basketball field and make the few steps to the beach. An even bigger Mangrove swamp can be found about 1km after the village. There is a sign indicating the path downhill. Arriving at the Kabila White Beach you have to pay a small fee and are requested to sign a guest book. Inside you find fine recreation area with one or two food stalls serving Filipino food and cold drinks. At the other end of the park is the breeding center and the education facility with an exhibition. Inside the breeding center there are glass aquariums with living Giant Clams of the four specimen found in the sea. Under a roof are big round concrete pools with much bigger clams. 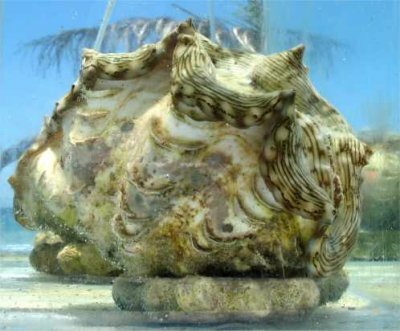 They are expected to mate and contribute to this reproduction site for Giant Clams. From the beach you see the marked sanctuary which is actually the nursery. For non-swimmers: It is a pleasure to observe the Giant Clams. They react on your movements and close their shells with astonishing speed. When you approach more carefully, or wait a few seconds while the clam opens again, you can observe the breathing and other movements. Go over to the round pools and get an impressive image of adult Giant Clams. Inside the education facility there are posters with information about endangered species and thousands of shells. Unfortunately the posters have seen better days but the vivid explanations of the young girls will shed light in your understanding. If the glass-bottom-boat is operating you may see the Giant Clams without getting wet. For swimmers: In addition to above dry visits you may go snorkeling around the nursery. You will first get some instructions, especially what you must not do. It is an unforgettable sight of this silent giants. From time to time the one or the other closes their shells with a super fast clap. - Entrance fee is PHP 25 including all "dry" activities. - For PHP 50 you can rent mask, snorkel and fins. A floater costs PHP 20. (A donation to the foundation is gratefully welcome). 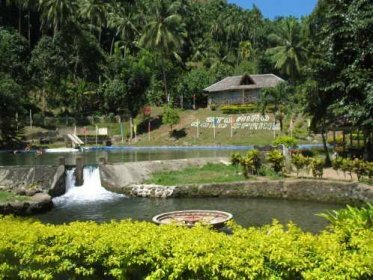 The Katibawasan Falls are a developed recreation area. The Katibawasan Falls are directly accessible from Mambajao. Just a bit south, out of the town center a 4.6km road brings you up. This is a concrete road with a parking lot at the end. If you only want to visit, reserve 1 hour. But it would be a pity not to swimm in the fresh and clear waters. Swimming suit, hat, sunglasses and sunscreen. If you want to climb, take good shoes with you. The Katibawasan Falls cascades 250 ft (76 m) down to a pool surrounded by orchids and ferns. Best time to visit is the rainy season of December and January or after a strong thunderstorm or rainfall. During El Niño years, there is usually less water thundering down. While a dip in the rather cold is on the program of most visitors, a stroll or even a hike in the vicinity is recommended. 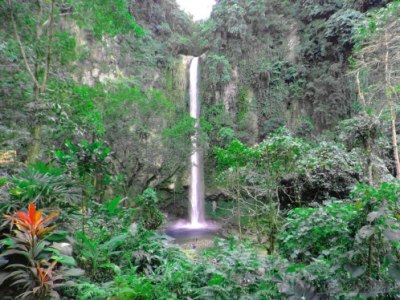 The humid micro-climate around the waterfall allows a real tropical rainforest to grow. If you are an avid hiker, go to the upper end of the waterfall. The water of the Macao (Macaw) Cold Spring is rich of minerals. This is why its water is blue - very blue. 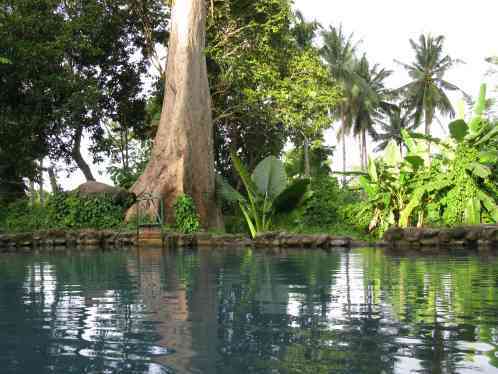 The vegetation around the pool is near rain forrest vegetation with giant trees and leaves. 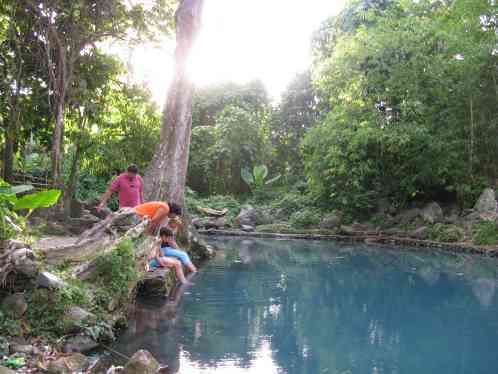 he Macao Cold Spring is 400 meters off the circumferential road in Brgy. Tupsan Pequeno, just 12km south of Mambajao. A visit takes 1 hour. Add spare time for a bath. CAUTION: The small road isn't easy to find. The large street sign can only be seen, when you come back from Benoni. Swimming gear and drinks/food. There is nothing available at the spring. Sometimes during the weekend there are improvised food stalls and unfortunately a karaoke machine. Nicely arranged pool with very cool water in a shadowy place. The water is rich of minerals. These minerals give the water a blue, smokey color. Take a refreshing bath and maybe get deeper in the surrounding forrest. You may also go up the Mapa Road. 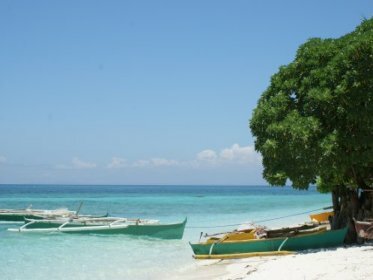 Mantigue Island is just about 4 hectares in land size. The white powdery beach glows from afar, creating a brilliant sight as you approach the little island. Mantigue is sometimes also called Magsaysay. Mahinog is 14 km south of Mambajao. A motorela covers this distance in 20 minutes. The boat ride from Mahinog to Mantigue lasts for another 20 to 30 minutes. Some dive resorts organize boat trips for divers and snorkelers to Mantigue. Swimming suit, hat, sunglasses and sunscreen. Snorkel, mask and fins for snorkelers and a bit more for divers. Mantigue Island is rather an experience than a sight-seeing tour. Mantigue is inhabited by 3 families, all related to each other. The whole tourism business has become more professional but has still very human dimensions. In earlier years you could sleep at a family's home on the island. The family members took care of you and provided you with a boat to Mantigue. They did cook for you and lent you some snorkelling gear for a minimum price. These families still maintain peace and cleanliness in the island but are not allowed anymore to accommodate guests. The island is surrounded by a gleaming white beach of powdery coral sand. The clear waters reveal the hard and soft corals and sea weeds that surround the island, making it ideal for swimming., snorkelling and diving. In the centre of Mantigue is a lush, green mini-forest filled with wild grasses and several trees and plants. 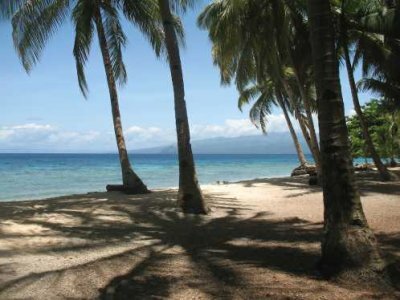 If you know the so popular beaches in the Philippines like in Boracay, Puerto Galera, Panglao, and El Nido and if you are tired of sharing a shoreline or beachfront with several other bunches of people, then Mantigue is the right place for you. On Mantigue you can feel like Robinson Crusoe and the local people will have their fun to play your Fridays. The newly created Mantigue Island Nature Park invites you to discover a unique scenery. Discover the dense tropical coast forest in the center of the island. And if you have a bit of chance, you may see one of the Marine-Turtles nests or even the newly hatched youngsters speeding to the sea. If you can, that means, if you have some time left, stay 2 or 3 days on Mantigue Island. It will do good to your physical and mental health. Rental of a motorela to Mahinog is PHP 200 for up to 8 passengers. The boat trip Mahinog-Mantigue-Mahinog costs PHP 500 for 6 passengers. 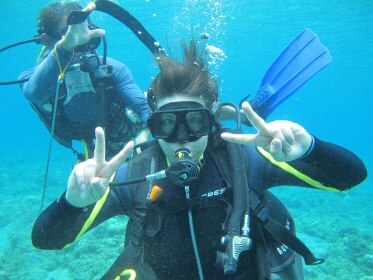 Rental of mask, snorkel, fins for one day is PHP 150 Resorts offer the Mantigue day trip (incl. meals, drinks, snacks) from PHP 1300 per person. 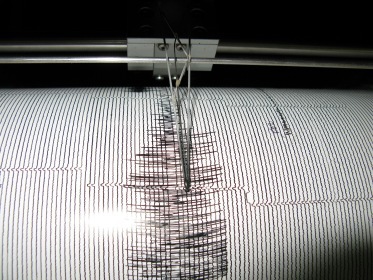 PHIVOLCS, the Philippine Institute of Volcanology and Seismology permanently supervises the activity of Mount Hibok-Hibok. A trip to the observatory is very interesting. You may even go on a volcano trek. The road up to the PHIVOLCS observatory starts straight mid-town Mambajao and climbs about 4.5 km. It is all concrete. The visit of the observatory will take about one hour. For the Hibok-Hibok trek see here. Nothing. For the Hibok-Hibok trek see here. You may visit the technical installation and the historical and scientific exposition. The staff welcomes you with pleasure and answers your questions with great knowledge. 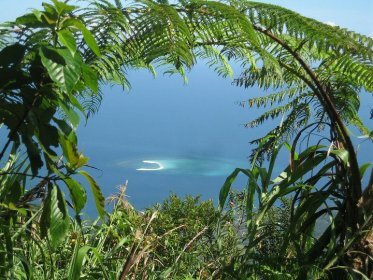 Camiguin Island consists of four overlapping stratovolcanoes overlying older buried edifices. 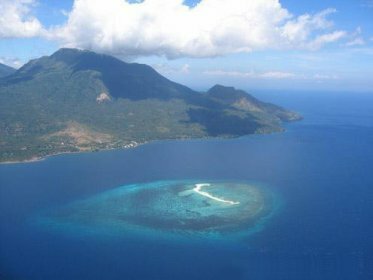 Mount Mambajao forms the high point of Camiguin Island at 1552 m. It has a youthful morphology with summit and flank lava domes, one of which partially fills a crater breached to the NW, but has not had historical eruptions. The eroded stratovolcanoes of Mount Butay and Mount Guinsiliban form the SE tip of the island and lie at one end of the NNW-SSE trending line of vents cutting across the island. The Binoni cinder cone lies along the SE coast. The youngest volcano, and the only historically active one, is Hibok-Hibok (also known as Catarman). It lies at the NW end of the island, about 6 km NW of Mount Mambajao. This andesitic-to-rhyolitic volcano contains several lava domes, including Mount Vulcan (also known as Old Volcano) on its NW flank. Major eruptions during 1871-75 and 1948-53 formed flank lava domes at Hibok-Hibok and produced pyroclastic flows that devastated coastal villages. 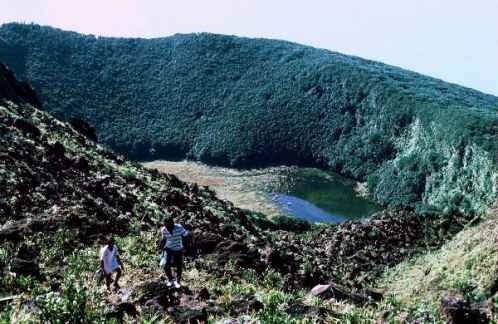 If you are in good physical condition you may like to go up to the peak and the crater of Mount Hibok-Hibok. Please see here. 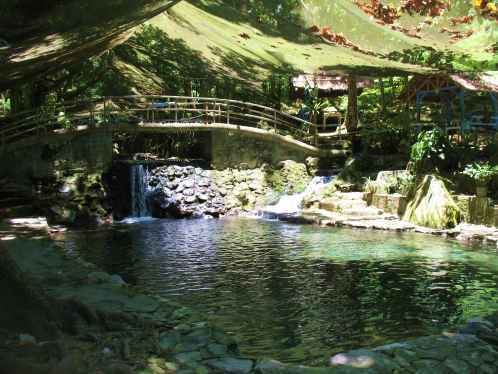 The Santo Niño Cold Spring lays on the west coast of Camiguin. Its crystal clear and fresh water makes it a pleasure to jump in the pool. The surrounding park is well maintained and the restaurants offer food and drinks. 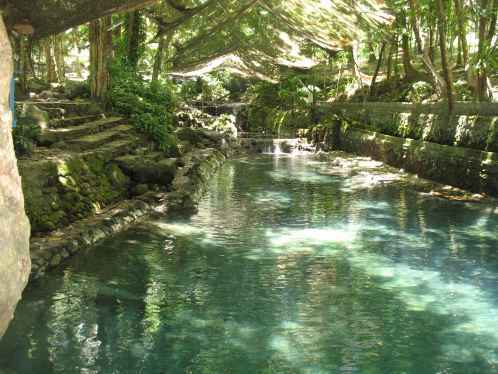 To get to the Santo Niño Cold Spring you have to turn around the island. Looc is at kilometer 40. So you may chose to turn east or west bound. On the ring road it will take you about 40 minutes (east bound, or an hour west bound). The distance from the ring road is about 4 km up hill. Nicely arranged park with a large and a smaller pool . On one side and at the gate are food stalls and restaurants. On weekends the Santo Niño Cold Spring can get very busy. It is an easy task to make friends during a refreshing bath. Take a refreshing bath and eat some wonderful Pinoy food. Inside the crystal clear water live small fishes. 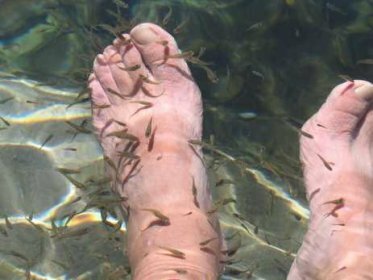 If you stay motionless in the water, these fish will come and pick off all the dead skin of your body. You won't feel them, but after half an hour your body will be clean and smooth. This treatment is even recommended for some skin problems like neuro-dermatitis. The stories of Old Volcano and the Sunken Cemetery are closely tied together. 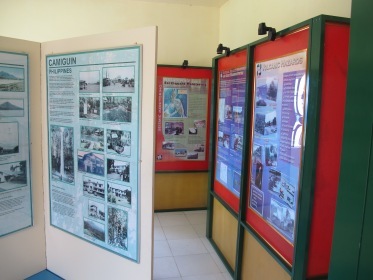 In 1871 a strong earthquake followed by an erruption of Mount Vulcan made slide the cemetery in the sea and destroyed the old capital of Camiguin. 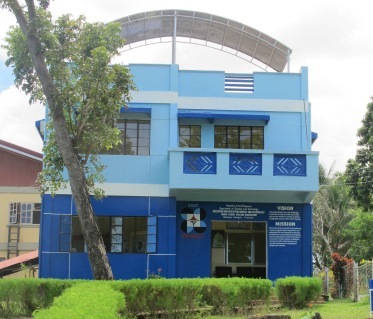 It is said that the old Capital, Catarman, had been larger than today's capital Mambajao. To mark the old cemetery a cross had been built in the sea. Nearby the ruins of the old parish church can be visited in Gui-ob (Bonbon. From Mambajao it is less than 10 kilometers. The visit of the church and the cemetery do not take more than half an hour. But you should go snorkeling or diving around the Sunken Cemetery, so add another hour. We recommend to visit also the "Via Crucis" at the same time. Swimming suit, hat, sunglasses and sunscreen for everybody. Snorkel, mask and fins for exploring the Sunken Cemetery. If you go up to the Old Volcano we recommend good shoes and enough to drink. 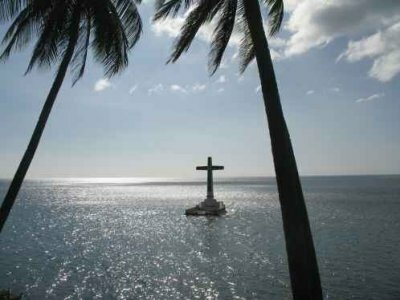 Sunken Cemetery: You cannot miss this landmark, a giant white cross in the sea. The cross marks the place of the cemetery, which is now some meters under water. Best is to go there just before sunset. During the summer months the sun sinks into the sea near the cross. If you are a snorkeler or a diver you may want to explore this site. Dive depth is between 5 and 20 meters. 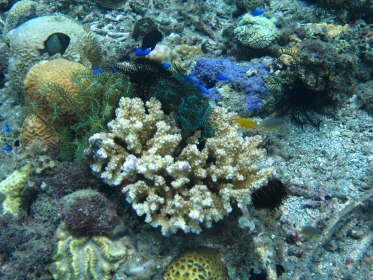 Underwater you may expect healthy soft and hard corals populated by different marine lives, a flat slope reef towards right side direction. The population is built of Batfish, Cuttle Fish, Octopus, Schools of Rudder Fish. It's an easy dive site without any dangers such as strong currents. For PHP 50 per head, the boatmen bring you over to the giant white cross. 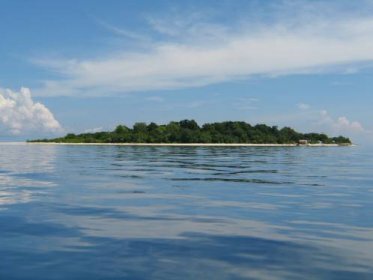 White Island is nothing other than a sand bar of sparkling white sand lost in the sea. 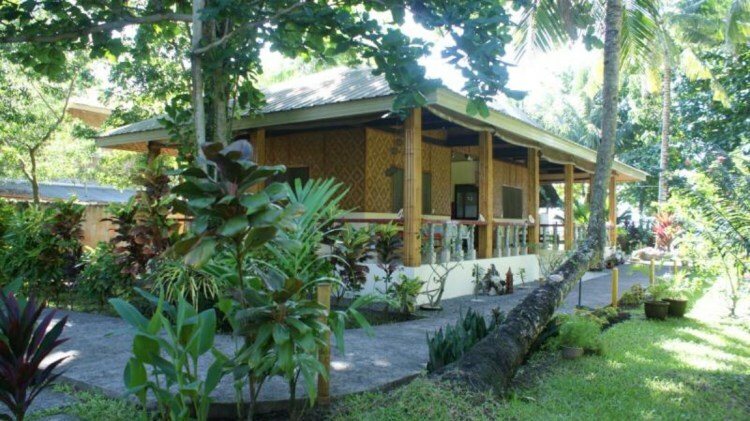 It lays a 1.4 kilometers off the northern shores of Camiguin Island between Brgy. Agoho and Yumbing. Brgy. Agoho and Yumbing are 4 km north of Mambajao. A motorela brings you there in 10 minutes. The boat trip from the boat-station in Yumbing (behind Paras resort) to white Island lasts for 8 to 12 minutes depending on the height of the waves. First of all a lot of white sand an then a great view of Mounts Mambajao, Hibohibok and Old Volcano. On clear weather conditions you see the island of Bohol and when it's extremely clear weather you may see the mountain tops of Leyte. An amazing feeling is the change between low tide and high tide. Go to the island at low tide and see the island shrinking for the next 6 hours. No fear, it will never completely disappear! Swim, snorkel, building sand castles or do simply nothing. REMEMBER: Re-apply your sunscreen after each bath and at least every 2 hours. This is not a hint, this is an order! Otherwise you look like her!